Description: This woody plant is a shrub or small tree up to 20' tall. It is usually abundantly branched and rather bushy in appearance. 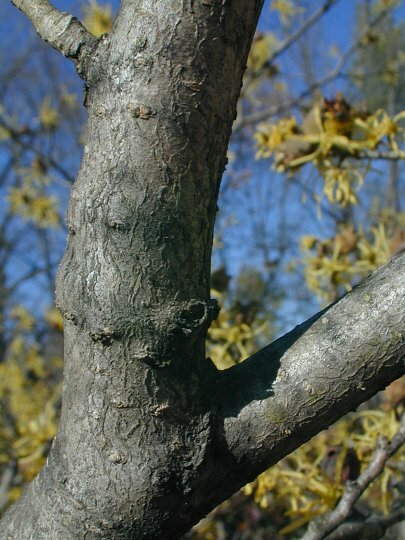 Witch-Hazel may have a single trunk up to 1' across, or there may be several ascending branches at its base. The trunk and/or larger branches are grey, relatively smooth, and slightly wrinkled. The smaller branches and twigs are grey to reddish brown. The alternate leaves are up to 5" long and 3" across; they are oval to broadly obovate in shape and wavy-toothed along their margins. The upper surface of each leaf is medium to dark green and hairless; the lower surface is pale green and hairless, or pubescent along the major veins of the leaf. The base of the leaf blade is often asymmetrical. The slender petiole of each leaf is up to ¾" long. 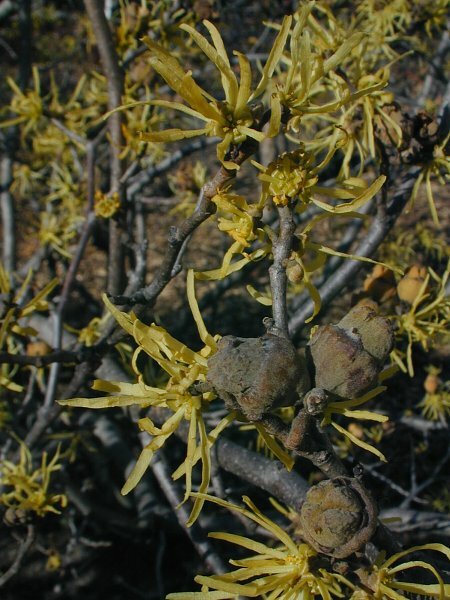 Small clusters of yellow flowers and brown seed capsules develop along the upper branches and twigs. Each flower has 4 yellow petals, 4 yellow sepals, 4 fertile stamens, and a pair of short styles. The tape-like petals are about ¾" long and linear in the shape; they are often contorted and twisted, rather than straight. The sepals are much smaller in size, broadly triangular, and recurved while the flower is blooming. The stamens are quite short. The blooming period occurs from mid- to late fall for about 3 weeks. This is the last woody plant to bloom during the fall; this usually occurs shortly after its leaves turn yellow and have fallen to the ground. After the flowers have withered away, some of them are replaced by seed capsules that require an entire year to mature. A mature seed capsule resembles a brown woody acorn about 2/3" (17 mm.) long; the upper third of this capsule is divided into 4 segments. Inside, each seed capsule has 2 cells; each cell contains a single seed. Mature capsules explode, ejecting the seeds about 10-20 ft. away. This typically occurs during the autumn while the flowers are blooming. The seeds are up to ¼" long, ellipsoid, shiny, and black. The root system consists of a woody branching taproot. This shrub/tree spreads by reseeding itself. Cultivation: The preference is light shade to partial sun, mesic conditions, and sandy or loamy soil. More flowers are produced in response to greater amounts of sunlight. 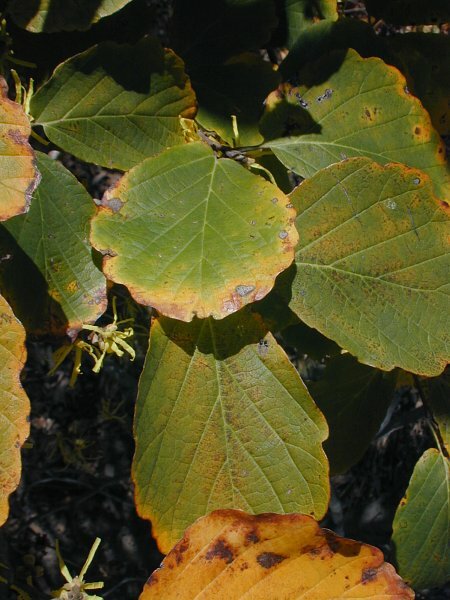 Range & Habitat: The native Witch-Hazel is uncommon in central and northern Illinois, while in the southern part of the state it is rare or absent (see Distribution Map). Illinois lies along the western range limit of this species; it is more common further to the east. Habitats include typical woodlands and sandy woodlands, typical savannas and sandy savannas, woodland borders, wooded slopes, stabilized foredunes near Lake Michigan, and restored woodlands. Witch-Hazel is occasionally cultivated as an ornamental shrub/tree in yards or along buildings. Faunal Associations: The nectar and pollen of the flowers attract primarily flies and wasps, including biting midges (Forcipomyia spp. ), non-biting midges (Cricotopus spp. ), march flies (Bibio spp. ), scuttle flies (Phoridae), flower flies (Syrphidae), Tachinid flies, flesh flies (Sarcophaga spp. ), blow flies (Calliphoridae), Muscid flies, root-maggot flies (Anthomyiidae), grass flies (Chloropidae), dung flies (Scathophaga spp. ), Braconid wasps, gall wasps (Cynipidae), Perilampid wasps, Pteromalid wasps, and Ichneumonid wasps. Other occasional visitors of the flowers include Halictid bees, Noctuid moths, flower bugs (Anthocoridae), and miscellaneous beetles (Graenicher, 1900-1909; Anderson & Hill, 2002). Other insects feed destructively on the foliage, sap, developing seeds, and other parts of Witch-Hazel. These species include seed-eating larvae of a weevil (Pseudanthonomus hamamelides), larvae of a bark beetle (Lymantor decipiens), a leaf beetle (Scelolyperus meracus), larvae of a gall fly (Asteromyia clarkei), various plant bugs (Miridae), a leafhopper (Eratoneura marra), the Witch Hazel Spiny Gall Aphid (Hamamelistes spinosus), the Witch Hazel Cone Gall Aphid (Hormaphis hamamelidis), and another aphid (Aphis hamamelidis); see Clark et al. (2004), Majka et al. (2007), Felt (1917), Knight (1941), Dmitriev & Dietrich (2010), Blackman & Eastop (2013), Pepper (1965). In addition to these insects, larvae of the Witch Hazel Dagger Moth (Acronicta hamamelis) and several other moths also feed on Witch Hazel, primarily on its leaves; the Moth Table lists these species. Less information seems to be available on this shrub/tree's relationships to vertebrate animals. The seeds are eaten by the Ruffed Grouse, Wild Turkey, and Fox Squirrel, while White-tailed Deer browse on the foliage and twigs and Cottontail Rabbits browse on seedlings (Martin et al., 1951/1961). Witch Hazel provides cover and nesting habitat for the Indigo Bunting and probably other birds. Photographic Location: A garden at Crystal Lake Park in Urbana, Illinois. Comments: Witch-Hazel provides abundant green foliage during the summer and attractive flowers during the autumn when little else is in bloom. The seed capsules resemble miniature cannons that expel their seeds with considerable force, making an audible sound. This unique woody plant can't be confused with anything else in Illinois.